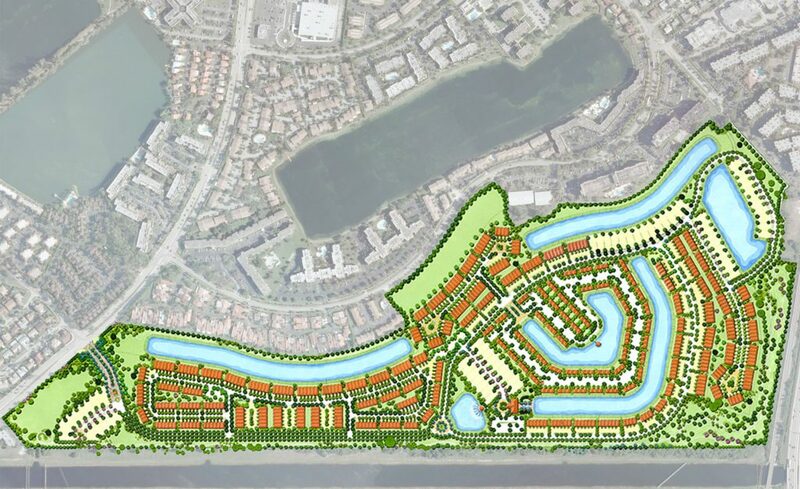 148-acre Planned Area Development (PAD) with 825 residential units in a mix of single family lots, townhouses and multi-family units. The community enjoys parks and green space extending over 60% of total development area. Led a multi-disciplinary team and provided planning and landscape architecture for the redevelopment of a golf course including master plan studies, final master plan and site plan approvals. Also secured a Department of Environmental Resources Management (DERM) tree removal and relocation permit for over 600 mature trees and palms. The design included entry features, roads, lakes, streetscape, perimeter buffers, parks and lush planting. The grand entry boulevard culminates in a roundabout plaza with views across a lake to a signature water feature and clubhouse and amenity area.